Digital printing is, by any measure, a versatile technology and particularly so when it’s used in combination with media that embodies physical properties extending its application-space. Add to that, digital print practitioners who can claim creativity as a core competence, and who have both the processes and skills needed to manage complex projects down to the last detail and what you have is a none-too-common ability to deliver landmark-scale graphic installations on time and within prescribed budgets. Fareham-based Bonwyke is one of a small number of companies that can claim the experience and resources required to realise such complex design briefs, that also throw up significant installation challenges. 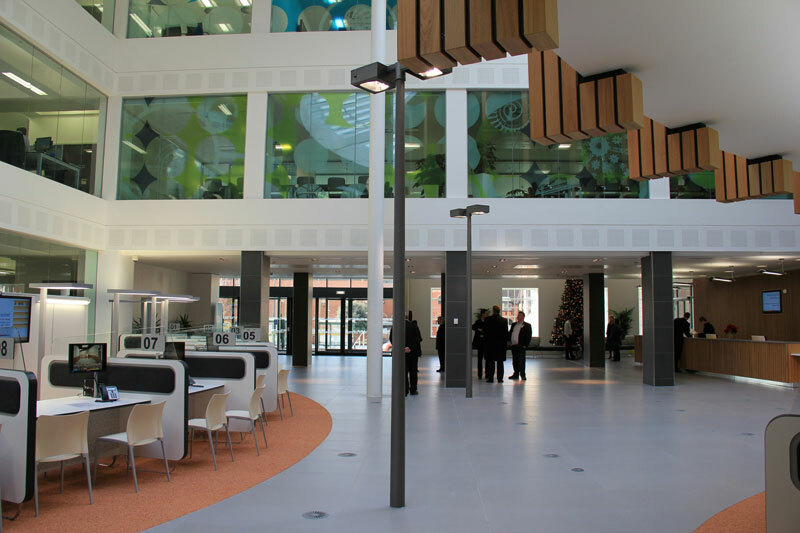 Recently, it has helped Bonwyke to win a competitive tender arising from the redevelopment of the Civic Offices for Derby City Council, which is extensive in its scope. The front facade of the original building has been retained as part of the works’ plan, but the balance of the structure has been removed and newly built. The works extend to four floors, including the ground floor and extensive expanses of glazing now define much of the available office space within. Bonwyke worked very closely with Matthew Hibbitt, Head of Design at design-architects Corstorphine + Wright, to achieve the right balance of colour, opacity and transparency for the graphics that now adorn much of the development’s glazing, with Bonwyke’s Jon Luangviseth using his pre-press and printing skills to combine the maximum amount of design impact, while also maintaining the required sight-lines. The design is grounded in geometric devices resonant of halftones. Planes of halftone colour occur at various apparent magnifications, occasionally intersecting and employing a colour-counterchange where features overlap. From these raw elements, pictures providing much of the ambient effect are formed and resolve themselves at a distance. However, when observed at closer quarters, the pictorial elements echo the geometric primitives comprising the design’s foundations. Taken with the transparent elements worked cleverly into the printing, the overall effect works brilliantly in imposing its presence and in maintaining the uplifting sense of space the architectural counterpoint provides. 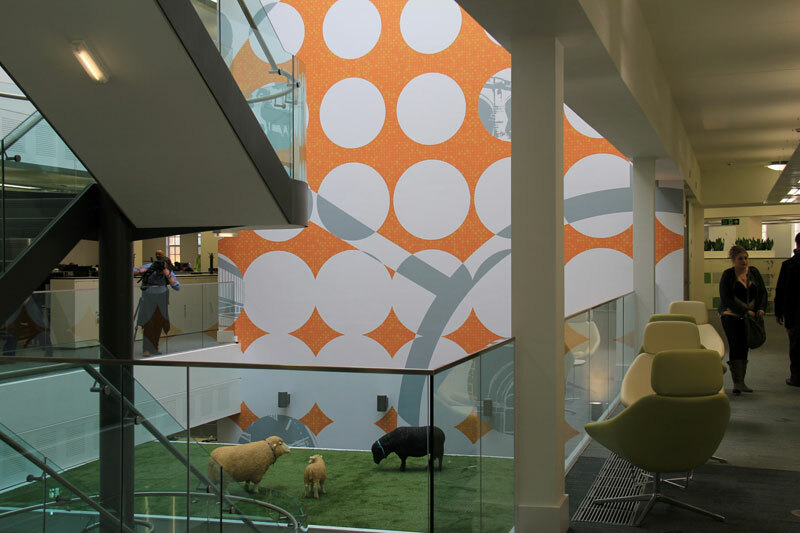 The two vast walls in the building’s atrium, each measuring seventeen metres tall and seven metres wide, provided a particular installation challenge that necessitated the use of specialist access equipment. Working closely with BAM Construction’s site team, Bonwyke employed a scaffold system to deal and embarked on the application in the full knowledge that the margin for error distilled to practically zero, with precise panel matching providing the key to maintaining the overall integrity and presentation of the design. 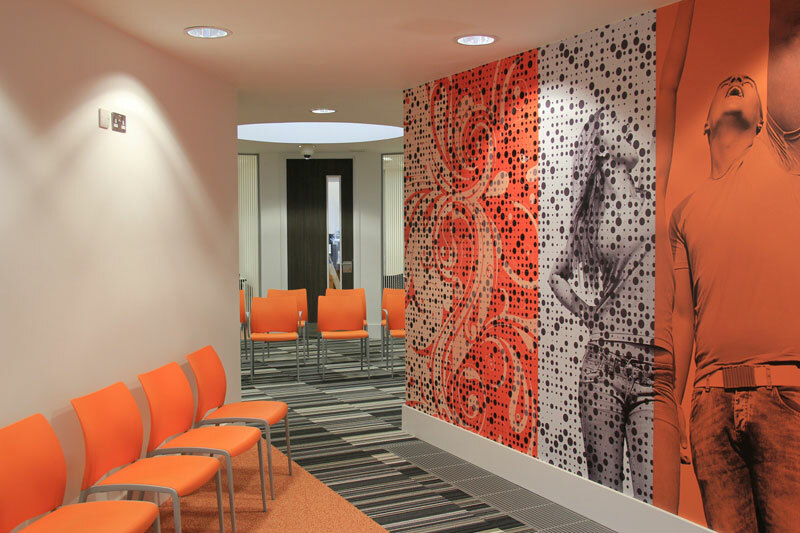 Bonwyke used Metamark MD5 with a satin laminate for the wall graphics. Satin finishes are known to dull contrast, sometimes to an unacceptable extent, but in this case, the overall effect is harmonious and totally in keeping with the aesthetics of the installation. The design can be readily appreciated from any vantage point, without flare from the ample, mixed source lighting negatively impacting the overall impression. 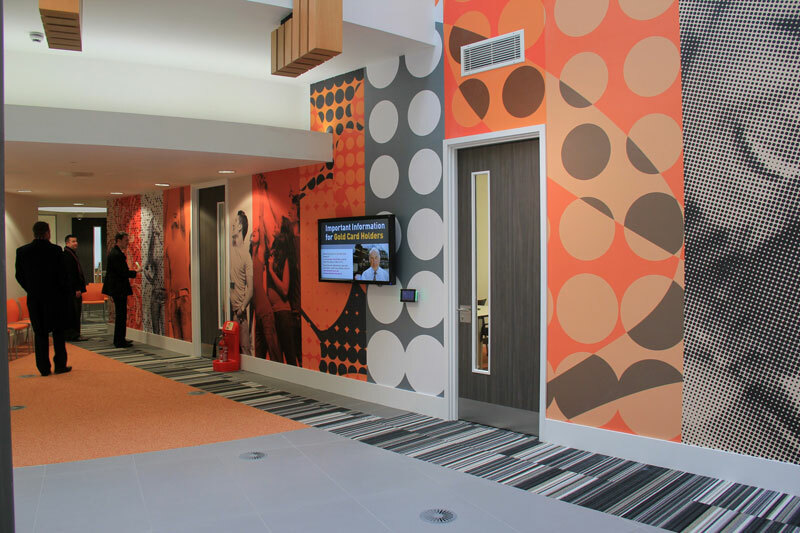 Eco-Solvent inks were used to print the wall graphics and, when used in tandem with the Metamark MD5 substrate, they deliver an impactful result that’s consistent with the colour-ways specified for the other elements of the project. It’s a credit to Bonwyke’s expertise that, despite the wide range of materials and different ink-sets used, the site presents as a perfectly coordinated and cohesive whole. The interplay of applied graphics and both available and ambient light has been managed to a fine degree. 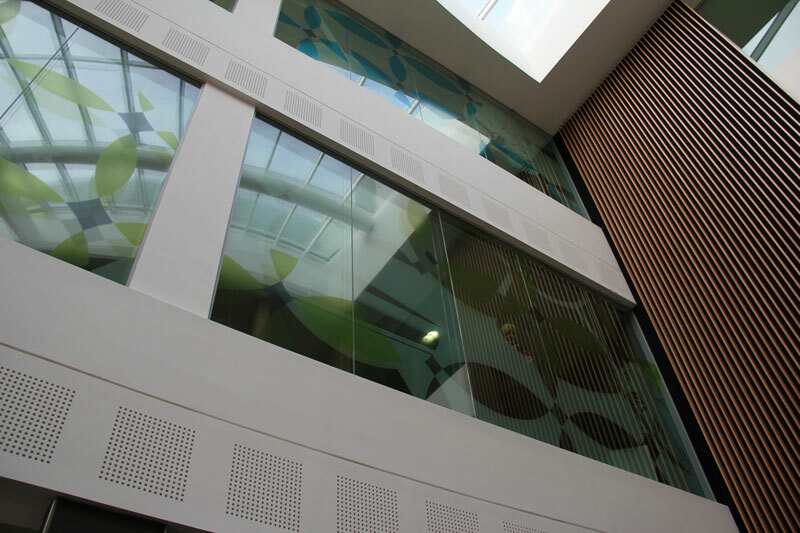 Accent colours realised in strong, vertical stripes have been provided in cut and applied Metamark MT translucent vinyl. Dependent upon the competing influences of transmitted or reflected light, the stripes register either as subtly lit, or as reflecting elements of colour. 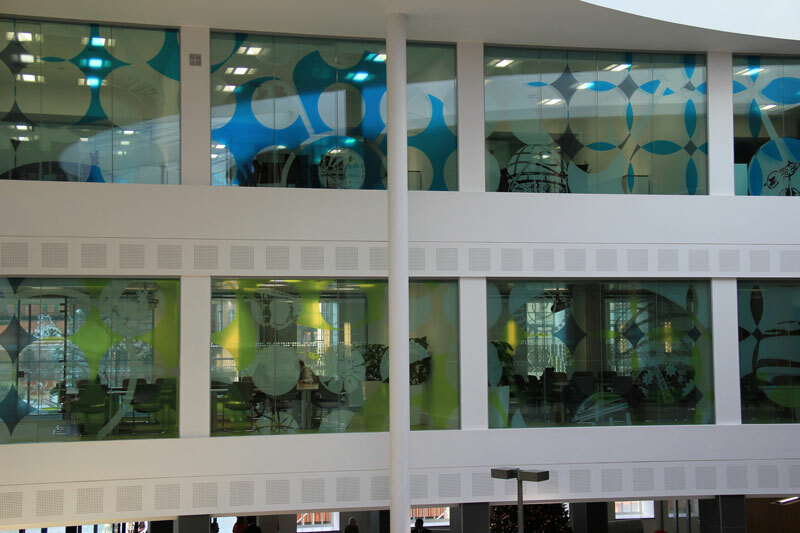 Bonwyke produced and installed etch effect graphics for much of the glazing manifestation, using design continuations and themes resonant of the locality’s history. The applied etch effects very effectively discharge their safety obligation, in as much as they provide the extensive glazing with immediate visibility, while also contributing significantly to the overall effect, but without impairing the passage of available light. 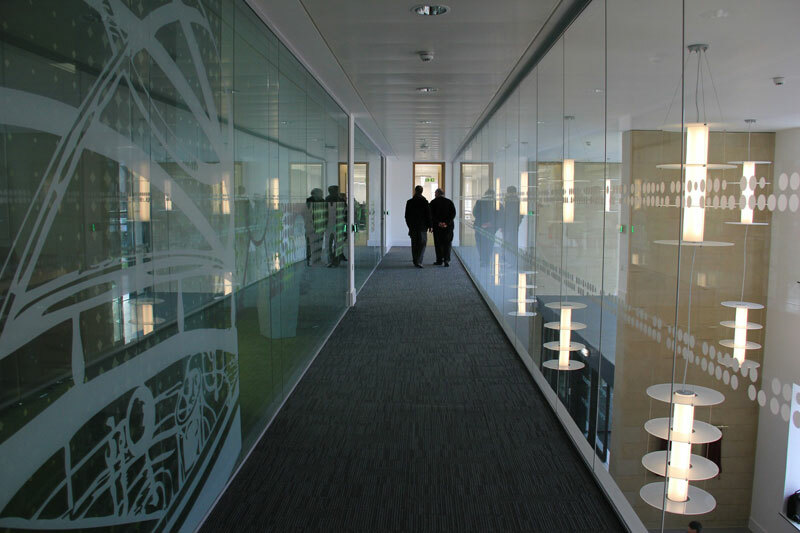 Metamark Etch Effect films, which feature the company’s Apex adhesive system, were used throughout. This optically neutral adhesive imparts no colour cast to the applied graphics and is designed to resist the effects of humidity, which are known to cause some adhesives to become milky in appearance. 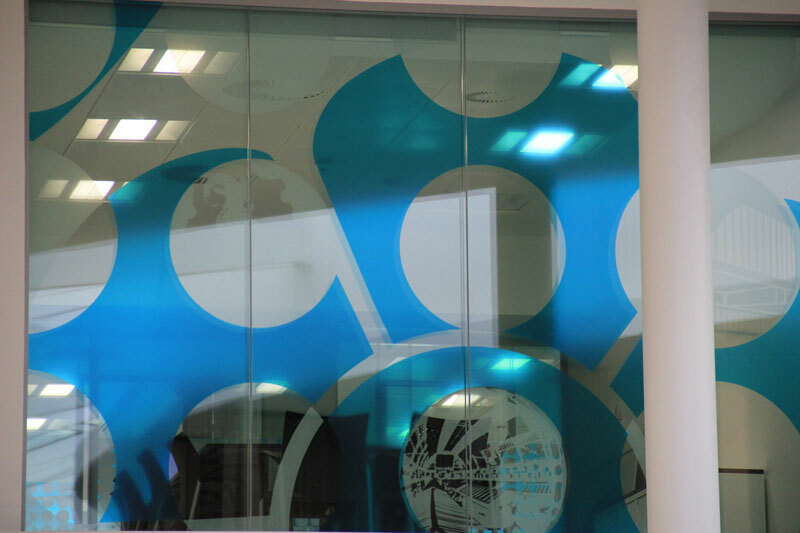 Providing optical continuity with the glass application surface, the applied graphics look crisp and well defined when viewed from either side. Bonwyke again used Eco-Solvent inks to print parts of the applied etched graphics, thus providing the films with a translucent quality that provides hints of ambient colour that is effectively balanced by the addition of Bonwyke’s own UV printed ProLAM material. 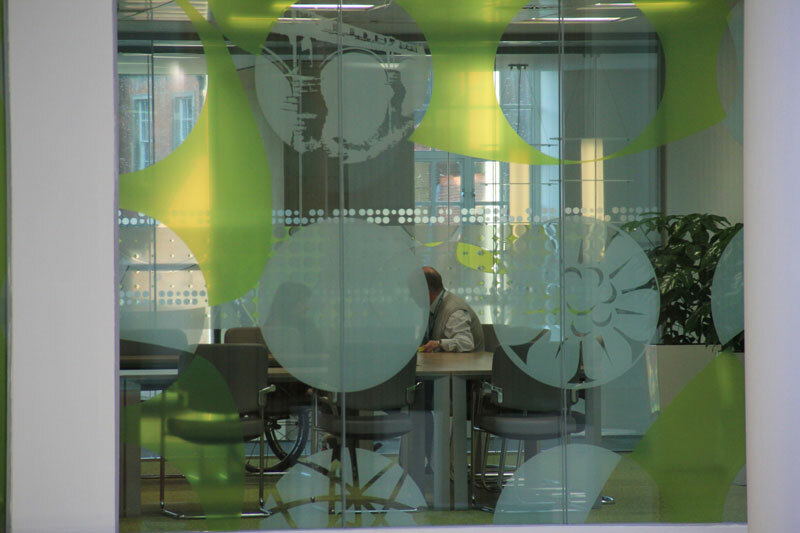 In total, Bonwyke designed, printed and installed over one thousand, five hundred square metres of graphics, across a variety of application and print production disciplines, much of it involving extensive pre-press manipulation. 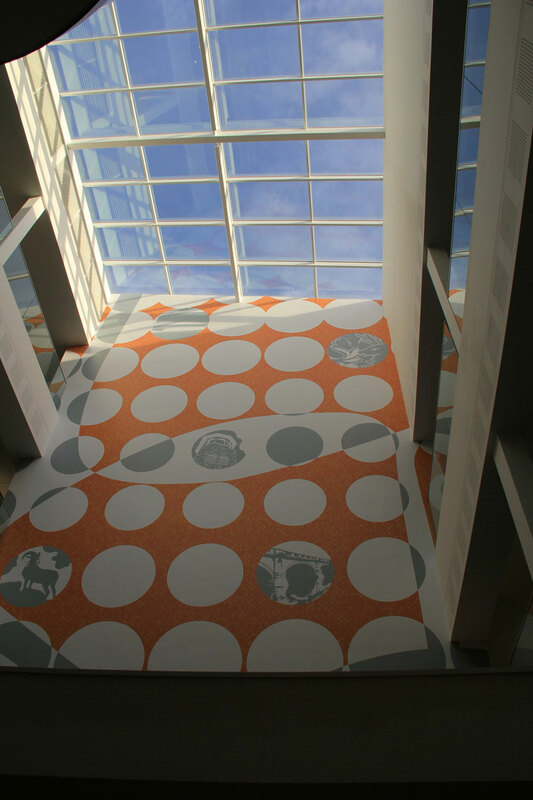 Despite the myriad detail, the work was scheduled around the surrounding building activity and the installation took place over a five-week period, finishing two days ahead of the time allotted. Any of the elements comprising the installation would stand in isolation as a quality exemplar of its medium. The print is flawless, the application precise and meticulously finished, with both standing up well to even the closest scrutiny. It’s a telling remark. Graphics, particularly those now realised on a landmark scale, can add a point of emphasis that harmonises with surrounding architecture and delivers an impact that’s just as potent, and every bit as enduring. Thanks to Bonwyke, the demand for this sort of application is growing, and hopefully, the market will follow.